Comprehensive guide to Modern Pressure Canning with mouthwatering deliciously photographed recipes. This cookbook includes an explanation of how pressure canning works, the necessary tools and step-by-step instructions within each recipe. The recipes begin with basic vegetables like carrots, green beans and corn. Next, the author moves onto more advanced vegetables such as pickled cauliflower and pineapple-flavored zucchini. The canned fruit section also includes pie fillings and a concentrated grape drink. The meat section includes pork, beef, poultry and fish plus bacon jam, soups, ground meats, and spaghetti sauce with meatballs. The final chapter includes tomato sauce, ketchup, red/green/peach salsa, chutney, bbq sauce, and poultry/beef/garlic/vegetable broth. Ideal for gardeners who need to preserve their summer crops and anyone who wants to taste summer farmer’s market flavor in the dead of winter. 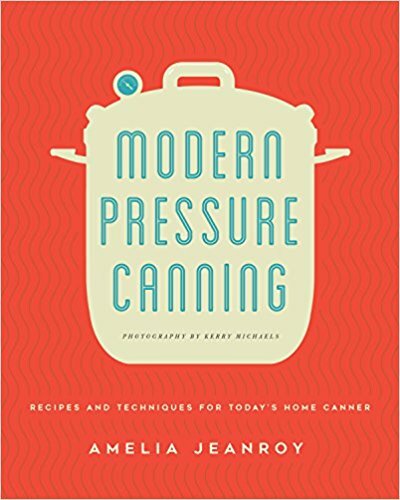 Modern Pressure Canning is highly recommended for anyone who has a pressure canner. 5 stars! Thanks to the publisher, Quarto Publishing Group/Voyageur Press, and NetGalley for a copy.